Jae Sung Cho of Residence Team at UNIST has been awarded the "Best Essay Prize" by KFPP. 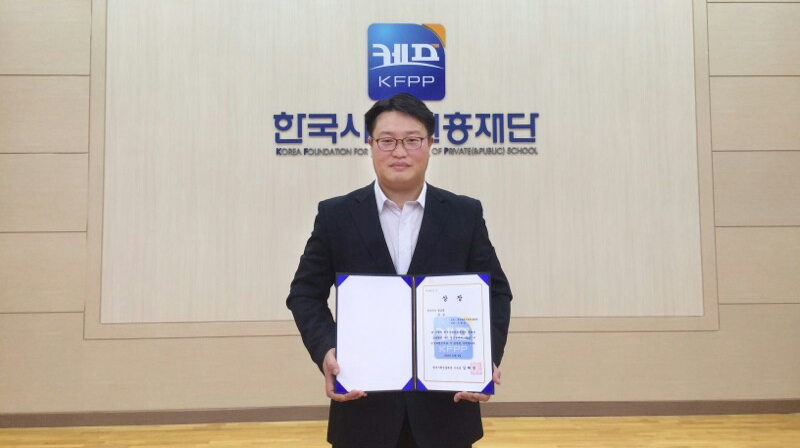 Jae Sung Cho, an employee of the Residence Team at UNIST, has been awarded ‘Best Essay Prize’ by the Korea Foundation for the Promotion of Private school (KFPP) for his paper submitted to the recent KFPP training program essay competition. Jae Sung’s essay was selected as the winner among entries, received from the faculty and staff members that have participated in the recent KFPP training program. His essay describes both the performance and the operation procedure of the Residential Advisor (RA) program that is currently being pursued by UNIST Residence team. The RA program provided at UNIST is not merely a residential advisor program, but a first-year connections program to support its students in making a smooth transition into university life. This successful program hosts various community involvement and student life activities on and off campus to help first-year students connect to the campus community, ensuring their success at UNIST. Moreover, through its Freshmen-Senior Mentor Program, the incoming students will have the opportunity to learn from their senior students about the programs they are in and get the inside scoop on how to achieve a successful academic and student life. Through the RA program, a group of 18 UNIST students has recently donated ten fire extinguishers to less privileged families of the local community. Another group of 28 students has also donated 494,000 won to help the people attacked by the Super Typhoon Chaba. The award ceremony took place at the auditorium of KFPP on December 2, 2016.